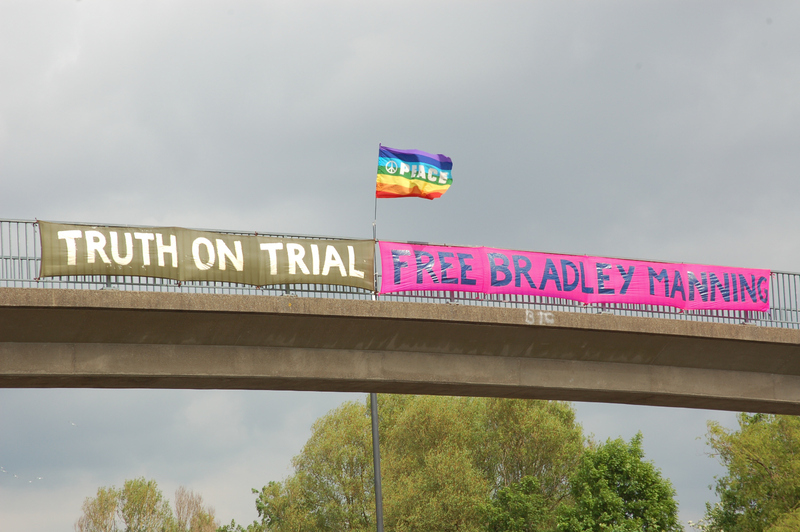 Yesterday, the Crown Prosecution Service decided to drop the Bristol Banner Drop case against Genny Bove, as there was ‘insufficient evidence’ (there was none) to support the charge of causing danger to road users. So we won’t be in Bristol on Monday after all. Rugby League World Cup – Play to Win! 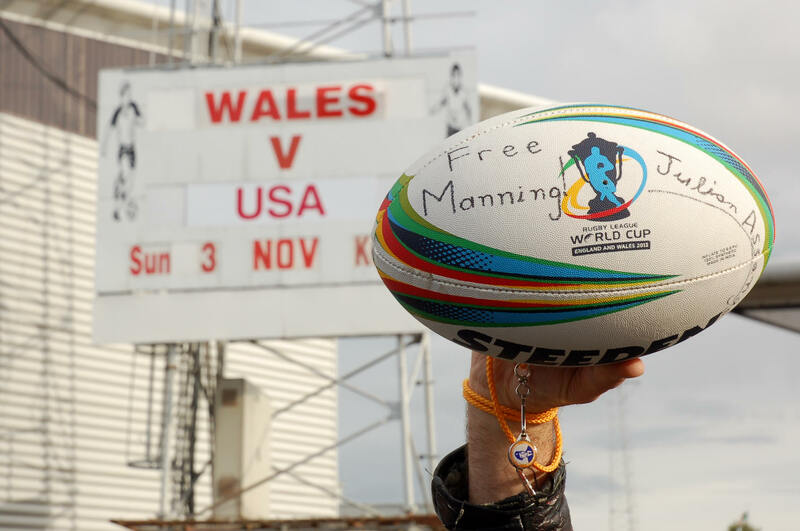 As the Rugby League World Cup comes to England and Wales, we’ll be packing a scrum of solidarity with Chelsea Manning in Liverpool, Wrexham and Bristol with a ‘Free Manning’ World Cup rugby ball signed by Julian Assange up for grabs. 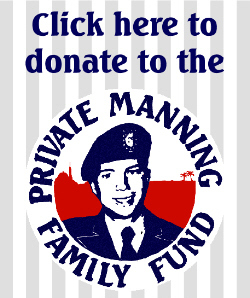 For a chance to win, just make a donation (minimum £1) to the Manning Family Fund any time in November by bank transfer, cheque or PayPal. Then send us the date and amount of your donation with your name and email or postal address. Good luck! 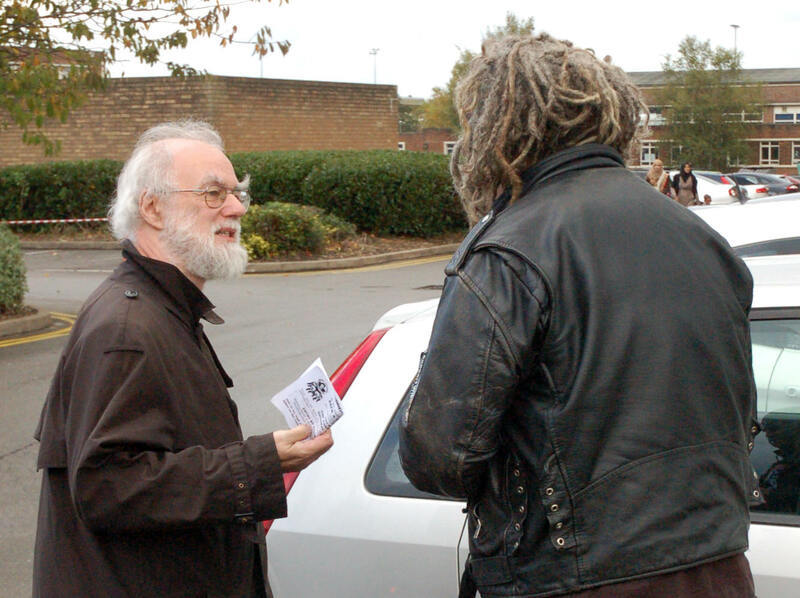 While we were filming this, the former Archbishop of Canterbury Rowan Williams stopped by for a chat and picked up a leaflet. 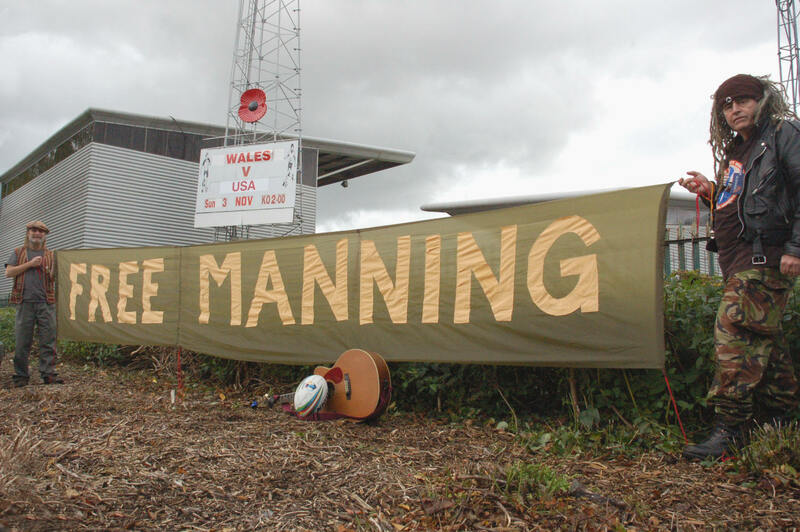 Manning supporters will be in Liverpool, Wrexham and Bristol for three days of fundraising and solidarity events from Saturday 2 November. 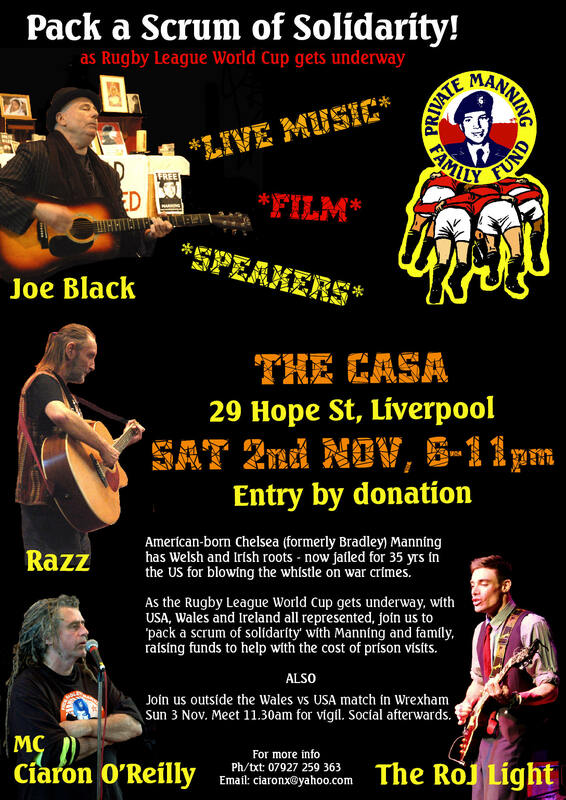 Benefit gig at The Casa, 29 Hope Street, Liverpool. Live music, films & speakers. 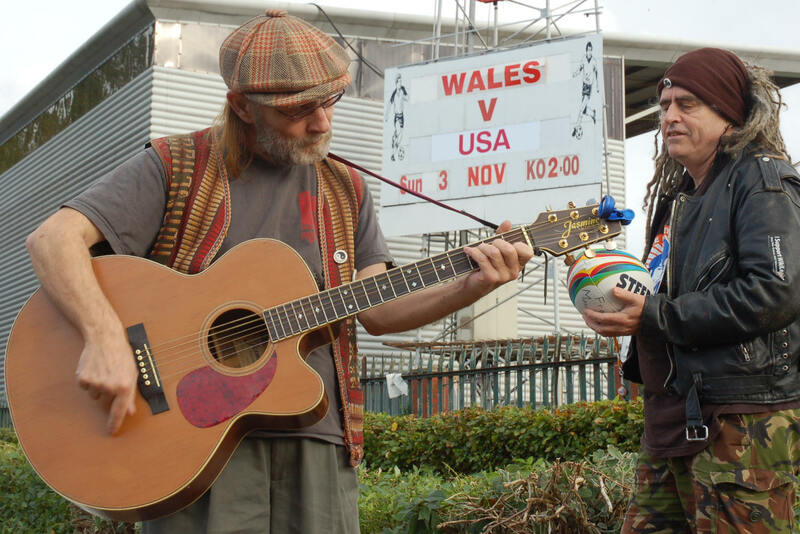 Vigil for Manning before the Rugby League World Cup match between Wales and USA. Join us afterwards too for a social at The Commercial in College Street, Town Hill from 2.30pm. Bristol Crown Court, Small Street. 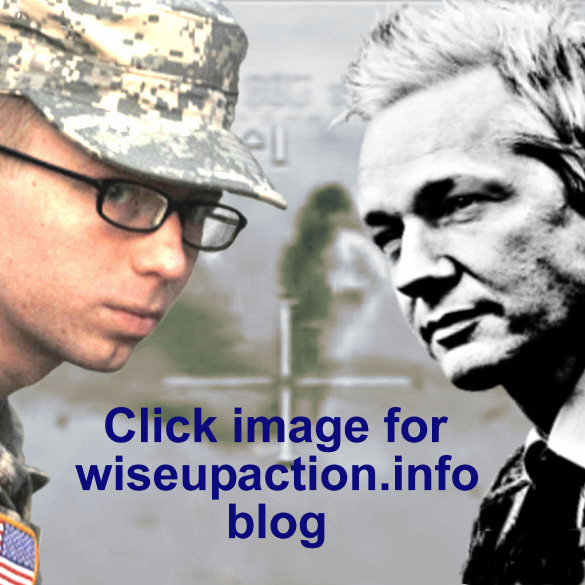 Vigil outside the court before the preliminary hearing in the Manning solidarity banner drop case. Thank you to you wonderful folks in Wales! I wish you had recorded the entire Help! song. That was fabulous and SO apropos. I never quite appreciated that song until I heard you sing it in this context. How about another round- and you record the entire song! Just beautiful. Love from San Diego, California! ALSO, thanks for posting the beautiful baby pictures of little Bradley. So precious.